Georgia Tech returns home looking to get even in conference play. Let's just get it out of the way. The last time the wine and cheese crowd came to Atlanta we ruined their New Years Eve. The Tar Heels were ranked #9 in the country. As of today, North Carolina is ranked #9 in the country. I'm not saying, I'm just saying. Carolina comes into this game on a bit of a hot streak. After suffering their worst loss at the Dean Dome since 2002 at the hands of Louisville, they have won three in row. One of those games was a whoopin' they laid on fellow ACC power Virginia Tech. The Heels are currently 5-1 in league and a half game back of first place. They are #1 in the league in tempo, 2nd in 3pt%, 3rd in offensive rebounding percentage and top 4 in offensive efficiency and effective field goal percentage. Those numbers are of course according to Kenpom. However, it is not the offense that is giving Roy Williams heartburn. While Carolina's defensive numbers are pretty respectable according to the metrics in league play, they aren't world beaters on that end consistently enough. They give up decent looks from deep and are susceptible to the blow-by on close-outs. The boys in powder blue are still led by Hall of Famer Roy Williams, who is now in his 17th season in Chapel Hill. It doesn't seem that long, but maybe that is just me. He is 438-130 in his time with the wine and cheese crew and has won three NCAA titles. In those 17 seasons he failed to finish outside the top 3 in the ACC only three times and has been omitted from the NCAA tournament only once. I picked this UNC team to win the ACC regular season title this year in the preseason. As far as rosters go, they have it all. Length, shooting, athletes, depth, size, coaching and experience. The Tar Heels currently boast four players averaging double figures in the scoring category. Cam Johnson has taken the reigns as the programs best player and been a terror from behind the arc this season. Through his first 10 games this season he has shot a ridiculous 49% from deep. He has hit a slump recently though and regressed to 46% on the season. His production has dropped a little bit during conference play so far, but that could be attributed to fellow wing Kenny Williams finally getting it together on the offensive end. Luke Maye came into this season with a lot of luster after averaging 16.9 and 10.1 in 2017-18 season. He is one of only two players in the ACC since 2000-01 to average 16 and 10 while shooting better than 40% from three. Many, myself included, selected him to be an All-American as well as the ACC Player of the Year. For me it was a foregone conclusion. His numbers are a bit down this year, but UNC has tremendous depth this season and that has alleviated some the load Maye has to carry. Both his minutes and usage rate are down this year compared to last season when it was basically the Berry and Maye show. Along with the two seniors come a duo of talented freshman. Coby White, an incredible scoring guard, runs the show for the Heels and is as quick as a hiccup. Even on made baskets he will get the ball and be at the logo by the time you get turned around. 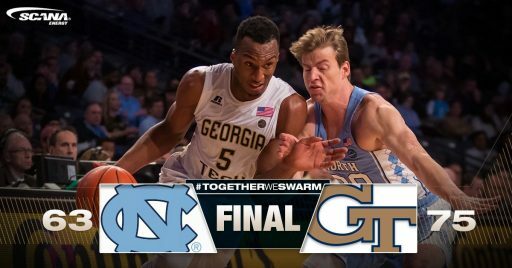 It will be imperative that Georgia Tech gets back down the court and into their 1-3-1 without White running up their back. White has taken a bit of criticism this season due to not being the typical Carolina point guard. He is not Ed Cota, Ty Lawson or Joel Berry. He is going to score first and second and maybe third, but he is not incapable of making highlight passes either. White has scored 15 or more point in every game during league play with the exception of the Louisville game. He also scored 33 points in 30 minutes earlier this season against Texas. The other freshman should be familiar to Tech fans. That is former top 5 recruit Nassir Little who is the Tar Heel's sixth man this season. It has been an interesting season for Nassir. Defensive inconsistency has led to him being a weapon off the bench instead of a fixture in the starting lineup, causing some fans questioning Coach Williams. A media member recently brought this to Roy during a press conference and the question obviously agitated Williams. In-game commentators later brought to light that it had been a tumultuous time for Little which was simply not true. It was a media fabrication. While his defense is still not quite where it needs to be with a rating of 101 (prone to the blow-by on close-outs), his offense is starting to show up in limited minutes. In his last three games he has averaged 15.3 points and 4.7 rebounds in only 17 minutes per game. A week ago in the whoopin' of VPI, he scored a career high 23 points in just 20 minutes. He is a unique athlete that will cause match-up issues for Georgia Tech in the half court, though the Jackets just played pretty well against maybe the biggest match-up nightmare in the last 20 years so we will see. Just because Carolina's defensive metrics as a team aren't great, they have some individual guys that play defense. Senior Kenny Williams is the Tar Heels' best perimeter defender and will no doubt find himself on Jose. While his defensive rating is not fantastic, it is also not reflective of his impact on that end on the floor. He is a good defender with good size. Jose is going to have to get crafty. Other players of note are Garrison Brooks who is a really good rebounder and is fantastic at hedging ball screens at the top of the key, pushing guards towards half court. Brooks paired with Maye could cause major problems for the Jackets on the offensive glass. Seventh Woods and Brandon Robinson (another former GT recruit) also provide quality depth this year for the Heels as both are finally living up to the prep evaluations. Perhaps the most overlooked player is 2018 5* recruit Rechon "Leaky" Black. While he only plays about 11 minutes a game, they are typically a very good 11 minutes. The kid simply plays winning basketball. He is a 6'7" guard who can handle the ball and wreak havoc on the defensive end playing the passing lanes. Look for him to make an impact at some point during this game. Tech will not have to deal with reserve big man Sterling Manley who has not played since December 29th due to knee soreness. Overall, this is a scary match-up for the Jackets. Tech has been susceptible to surrendering offensive rebounds out of the zone, and this Carolina team is built to excel in that single aspect of the game. Carolina's size on the wing is another issue. Cam Johnson is actually the Tar Heel's tallest starter and he is typically going to play 22 feet from the hoop hunting clean looks. The good guys surprised me in the most hostile environment in the league on Saturday and have always played better at home under Pastner. Similar to the Duke game, keep it close, keep it respectable. Anything can happen in the last two minutes of a five point game. awbuzz, lauraee, GT_EE78 and 1 other person like this. AUFC and msargent1 like this. I’ll bring the milk, if you’ll bring the bread. gtpi, slugboy, Gtbowhunter90 and 1 other person like this. bwelbo, LargeFO, gte447f and 1 other person like this. I have a feeling ya might mention Nassir Little. lauraee, bwelbo and Peacone36 like this. I think everyone should wear green. Yeah, he would've been a difference maker for us this year as well. He was incredible vs vpi. By the way, did anybody else notice that the ACC gave uNC a whole week off before their game against us? Did the basketball schedulers somehow get the football memo? lauraee, tbglover, ESPNjacket and 1 other person like this. Yep i don't even think the game was televised a few years ago because of ice. I'm looking for a little consistently, I think we are at the time in the season where our youth needs to start showing some maturity. Anyway, per ESPN's schedule the game is televised on the ACC Channel, so I should get a chance to watch ... looking forward to it ! Game is on here in Michigan! It was posted on the ESPN schedule site the same way for Saturdays game at Duke and I got it, I think it was DirectTV Channel 646 ... BTW, I live in Idaho. 1) Turn off your Wifi from your phone, Most phones have a quick access drop down menu and the WiFi button is normally the first one that appears. awbuzz and lauraee like this. This game scares me in the match ups. UNC is a much better shooting team than Duke. This game is winnable but we will need to play a great game and score inside. Apparently FSU is getting a week off before us too.